A crocheted succulent never needs watering, never dies, and is always in peak condition. 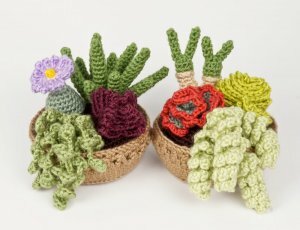 With these collections, you can make 8 different realistic succulents in individual pots, or a beautiful succulent garden arranged in one large crocheted pot. It's the perfect thing to brighten up your window, or to give as an unusual and thoughtful gift. Succulent Collections 3 and 4 are original crochet patterns by June Gilbank. An individual succulent makes a quick and sweet gift. Two or three (or more) individual succulent pots look great arranged in a line along your windowsill. The larger succulent garden makes a beautiful decoration - and you'll never have that problem where one of the collection dies and you're left with a big empty space in the pot! Details: each pattern is 18 pages long and includes dozens of step-by-step photographs and explanations so you can crochet perfect succulents of your own. They also include two appendices (for right- and left-handers) with a detailed step-by-step photo tutorial for the decorative textured zig-zag pattern on the large pot. Yarn: worsted weight yarn in at least one shade of green (succulents); red and beige (contrast colours); purple, white and yellow (flower);brown (soil), and any colour you like for the pot. And you can mix and match the patterns with Cactus Collections 1 & 2 and Succulent Collections 1 & 2 to create your own custom garden! Date Added: 08/29/2018 by Kimberly R.
Date Added: 08/13/2018 by Marissa L.